Microsoft MapPoint is a discontinued software program and service created by Microsoft that allows users to view, edit and integrate maps. The software and technology are designed to facilitate the geographical visualization and analysis of either included data or custom data. Numerous acquisitions (Vexcel, Vicinity Corporation, GeoTango, etc.) have supplemented both data and feature integration. MapPoint is intended for business users but competes in the low-end geographic information system ("GIS") market. It includes all of the functionality of the most recent version of Streets and Trips, the consumer mapping software, at the time of development, as well as integration with Microsoft Office, data mapping from various sources including Microsoft Excel and a Visual Basic for Applications (VBA) interface allowing automation of the MapPoint environment. The MapPoint technology is also used in Microsoft Streets and Trips (for North American home users), Microsoft AutoRoute (for Western European home and small business users), Encarta's atlas functionality, Bing Maps and Bing Maps Platform. MapPoint, along with its companions Streets & Trips and Autoroute, was officially discontinued on December 31, 2014 and has no further product support. Bing Maps, along with the Windows 10 app Windows Maps are being represented as the replacement/alternative to MapPoint. Microsoft MapPoint as the software is typically updated every two years and available in both upgrade and full packaged product form; the current and final version is 2013. Previous versions were released starting with 2000 (developing from Expedia Streets and Trips Planner 98, a consumer mapping application included with Office 97 Small Business Edition), which was slated to be included in the Office 2000 Premium Edition suite, but never was. MapPoint 2009 (v16), updated interface with bigger icons, core engine remains the same. This version introduced Product Activation for MapPoint Retail versions  although the MSDN, Software Assurance and OEM versions did not require activation. New versions have not always been at the same time as the equivalent Office releases despite being numbered similarly; notably the 2002 release was excluded from the Office XP suites due to a lack of equivalent programmability, and 2006 was released well before Office 2007. The program's icon and toolbars were not updated until the 2009 release to stay consistent with modern software applications. 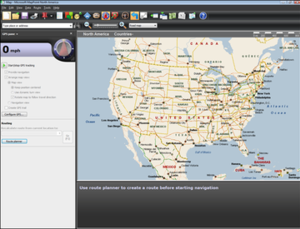 Version 2009 sporting an overhauled interface and claimed better Office integration was released in late 2008. The core map rendering engine remained the same and the GIS data was not updated as recently as one might expect of a product released in 2008, leaving out subdivisions, roads and other features that were completed in 2007 and which are shown on online mapping systems. Further, the 2009 version replaced all built-in icons with icons that were mostly brown or darker colors. This made them difficult to see on the map and resulted in users trying to restore the icon sets from version 2006. The software is available for Microsoft Windows, and includes a less-featured edition entitled Pocket Streets for the Windows CE family of products, such as Pocket PC, and Windows Mobile for Smartphone and Automotive. In 2002, Microsoft launched a free online MapPoint service. This was superseded by MSN Maps, Live Search Maps, and Bing Maps. ^ a b Lilly, Paul (15 July 2014). "Microsoft Decides To Discontinue MapPoint On December 31, 2014". HotHardware. Dave Altavilla. ^ a b Popa, Bogdan (7 July 2014). "Microsoft Kills Three More Software Products". Softpedia. SoftNews. ^ a b Thurrott, Paul (7 July 2014). "MapPoint and Streets & Trips Step Aside for Bing Maps". Paul Thurrott's SuperSite for Windows. Penton Media. ^ "Microsoft MapPoint History". Microsoft. 11 July 2014. ^ "Official Microsoft MapPoint Website". Microsoft. 11 July 2014. ^ "Office 2000 "Family of Products" Adds Breadth and Depth to What Businesses Can Accomplish". Microsoft.com. 1999-07-12. Retrieved 2013-06-15. ^ Adding MapPoint 2006 Pushpins to MapPoint 2009, MapForums, a Community of VE/MapPoint Users and Developers. ^ Robinson, Gail. "Microsoft launches UK mapping website". Webuser. Archived from the original on 26 July 2011. Retrieved 26 July 2011. ^ "MSN MapPoint Offers a Better Alternative to MapQuest With a .NET Future; MapPoint .NET Platform Combined With Intuitive User Interface Brings Location Intelligence to Life on the Web With MSN MapPoint, Carpoint and HomeAdvisor". Microsoft. Jan 24, 2002. Retrieved 26 July 2011. This page was last edited on 11 February 2019, at 07:51 (UTC).